Proximity to freeways in Minneapolis. Map created by the author. This map shows areas of Minneapolis that are located within 1/4 mile (bright reddish-purple shading) and 1 mile (lighter purple shading) of a freeway mainline. Due to its divisive nature and regional significance, I have included Hiawtha Ave in the analysis. As you can see, most of the city is within a mile of a freeway mainline, with the main exceptions being sections of North Minneapolis (west of Penn Ave N), Northeast Minneapolis (mostly north of 27th and east of University), a good chunk of Southwest Minneapolis (Lake Calhoun, Lake Harriet, and Linden Hills), and small bits of south Minneapolis. Most of the negative aspects (noise, pollution, etc) of freeway proximity happen within 1/4 mile of a given freeway. Thankfully, much less of the city is within this proximity, though it does include the entire Warehouse District and chunks of Seward and West Phillips. Of the roughly 57.4 square miles in the city, almost 46 square miles (about 80%) are within 1 mile of a freeway, and just under 16 square miles (about 28%) are within 1/4 mile of a freeway. I think you mean miles instead of acres. Yes, I did mean “square miles” instead of “acres”. Would love to see this for Richfield. I imagine one purple blob, mostly fuschia. Why is Hiawatha Ave included but not Olson Hwy? In addition to carrying the same trunk highway, they seem to be fairly similar in character and divisiveness (if Olson Hwy is perhaps a little more aesthetic). Interestingly, my boyfriend now lives near Hiawatha and Lake, but previously rented in Linden Hills. He found the lack of access to freeways (well, and transit and continuous streets) extremely frustrating, and a major problem to living in the area. 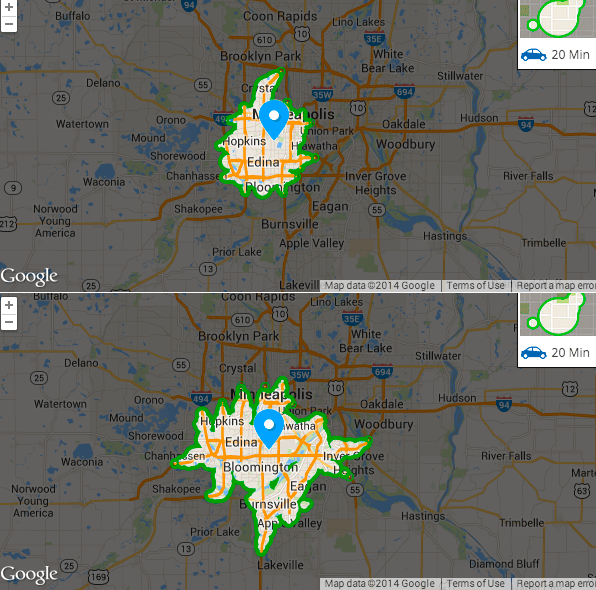 Here’s a comparison of the auto travelshed between my address in Richfield with an address in Linden Hills via Walkscore. Mind you, in Richfield terms, I live relatively far from a freeway, centered almost exactly between Crosstown and 494, 35W and Cedar. Basically the only point that the Linden Hills address has better access to is the northern TH 100 corridor. Obviously to most readers here (myself included), freeway access is not everything, and other modes are more important than auto access. But especially as new transit projects attempt to use freeway corridors, lack of access to freeways could be a mobility impairment. But what did the accessibility of inner-ring suburbs, etc in to Minneapolis by freeway mean for the former accessibility of Minneapolis residents? Not just distance traveled, but number of destinations available. How many shops, restaurants, jobs, etc were lost to the freeways themselves (4.2% of land area) & parking lots to store all those cars? What about safety? Pollution? Respiratory health? Imposed barriers to movement because of the freeways (whose limited access points present far less utility to city residents vs those coming in)? I think folks who hold up freeways and the system of collectors to feed them (not saying you’re one of them) use mobility as a big supporting factor – look at how much further someone can get in the suburbs vs the city! – without considering the many other factors at play. Additionally, what would the same level of accessibility have cost us had we continued to improve on traditional development patterns? Pragmatically, there’s no use in crying over spilled milk (so to speak), and we should focus on making the most equitable and cost-effective investments with the system we have. Wasn’t intended to be a “suburbs” versus “city” thing. Had it been, I probably would not have chosen either Richfield or Linden Hills, since Linden Hills is a very suburban portion of Minneapolis, and Richfield is a relatively urban first-ringer. (In fact, the population densities are about the same, and Linden Hills has less transit service and less diversity.) 35W, Crosstown, etc were not built for the Richfields and Edinas of the world, which were nearly 100% built up at the time of their construction. Rather, freeway construction fueled the Lakevilles and Woodburys of the world. Arguably, the first ring has paid a huge price to afford quick access to jobs in Minneapolis and quick access to suburban amenities for Minneapolitans. But they have gotten at least one benefit, of mobility. The point was that although there is a benefit to being away from freeways, there is also a cost of living in a relatively freeway-isolated area. What I would object to more is areas where freeways have replaced all other mobility. The TH 100 corridor through Edina and SLP exemplifies this. There are a couple Life Time Fitness gyms I go to, namely St. Louis Park and Target Center. To bike from the gym in SLP to my workspace in Edina at 77th and 100, I have to go about 50% farther than the freeway distance, winding around trails, minor streets, frontage roads to get where I want to go. It takes 35 minutes for me to bike from my home in Richfield to the gym at Target Center. But nearly an hour to go a slightly shorter distance (as the crow flies) from the SLP/West End gym to my coworking space. Well… those freeways did both (serve inner ring suburbs and fuel further growth). Yes, inner ring suburbs filled out in the 40s and early 50s. But, despite being mostly built on a grid (technically transit-supportive), the distances to downtown (making transit journeys that much longer) and preference for cars certainly factored in to their desire for freeways. Edina, Richfield, et al all supported/pushed for not only the ring freeways (62, 100, etc) but also the 35W routing (with very little local pushback, certainly not on the scale that Minneapolis neighborhoods saw). I’d say that the core cities paid a higher price – they gained mobility to jobs and amenities that used to be located within their city (formerly accessible by multiple modes), but this certainly wasn’t meant as a suburb vs city thing. Just that I don’t think framing the discussion as mobility (how far can you travel) is as important as accessibility, and that the improvement in the former (via freeways) didn’t really improve the latter for Minneapolitans, and certainly wasn’t worth all the negatives. I’d hardly say revisionist. That exact paper is what I based my understanding of the region’s freeway development on. I’m not saying Minneapolis wasn’t part of the freeway planning process – the leaders at the time clearly were. I’d even go so far as to say that planners back in the 30s/40s looking to alleviate traffic running through the city to destinations on the other side by building a ring on the outer borders was a good idea (not too different from European city road building). Remember, in the 1930s when that plan would have been put together, Richfield was still mostly *not* built-out yet. shopping center, Southdale, was generating traffic on neighborhood streets. 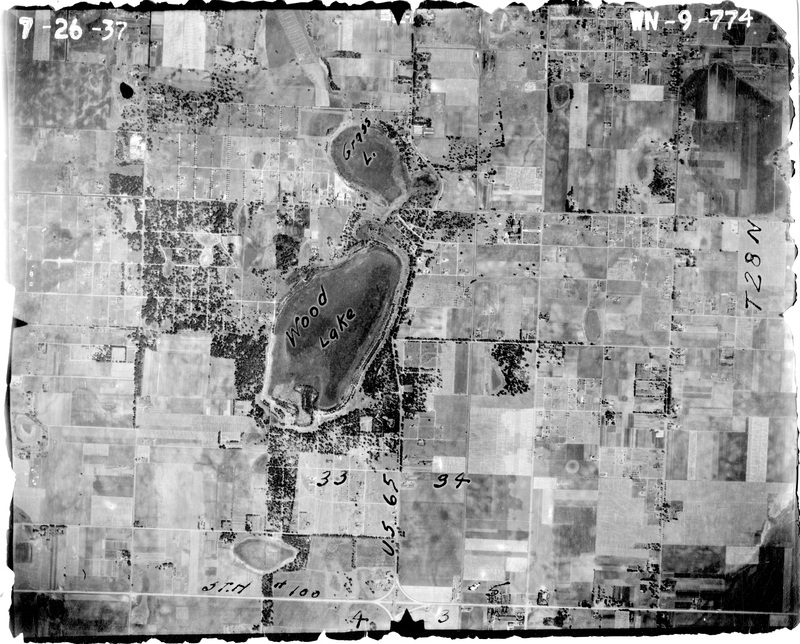 Other than the negotiations by Richfield business interests, the only other citizen protest was regarding Wood Lake along I-35W as it approached the common section.” If you had to guess what the general population of 1950s Richfield and Edina – predominantly white, wealthy families who owned cars, used them for daily shopping and activities, and worked in Minneapolis – felt about freeways at the time, what would you say? I imagine they supported freeways — as I imagine most of the people over the border and in much of Minneapolis also supported freeways, at least those who owned cars. Had they not supported it, I would not think their leadership would have led the charge to build more. a.) Lack of NIMBY influence does not equal lack of caring — which seems to be the case for 35W’s alignment through Richfield. b.) This was a mutual decision, but the largest force that had the power to do this (or stop it) was Minneapolis. We’ve all paid a price, but we all have gained a benefit of mobility. I wonder what the transit commute mode share was for Richfield in the 40s vs Minneapolis? Car-ownership rate? Minneapolis’ support (even their position int he drivers’ seat at times) came far more from the business interests that viewed freeways as necessary to compete and attract workers and city leaders themselves with a certain vision for mobility, slum clearing, etc (without consideration for negative impacts). Fast forward 20 years and ask what municipalities had a larger voice in opposing vs supporting freeway construction. The lack of community organization and opposition was almost certainly prevalent in both the core and inner-ring suburbs. Since massive-scale freeway building had never been done before, it quite quickly o locals. “Politics and Freeways” notes: “Leaders of the African American community became aware of the approval of the St. Anthony route in 1953, six years after it occurred.” What I’m saying is that populations in the core cities were far more likely to oppose freeways than inner-ring suburban counterparts given their economic status, race, and housing location. That their voices weren’t represented at City Hall doesn’t mean their share didn’t outweigh those in other municipalities. And other than some office jobs, are there really that many amenities that no longer exist within Minneapolis? Mall of America or a Costco might be a compelling amenity — for which residents benefit from mobility to — but it obviously didn’t exist pre-freeway. I’m not convinced that that many existing amenities moved out of Minneapolis because of the freeways. The types of businesses that supported 520k people on a daily basis (most within walking distance) compared to a population low of 368k. That’s a drop of ~150,000 people, about 30%. 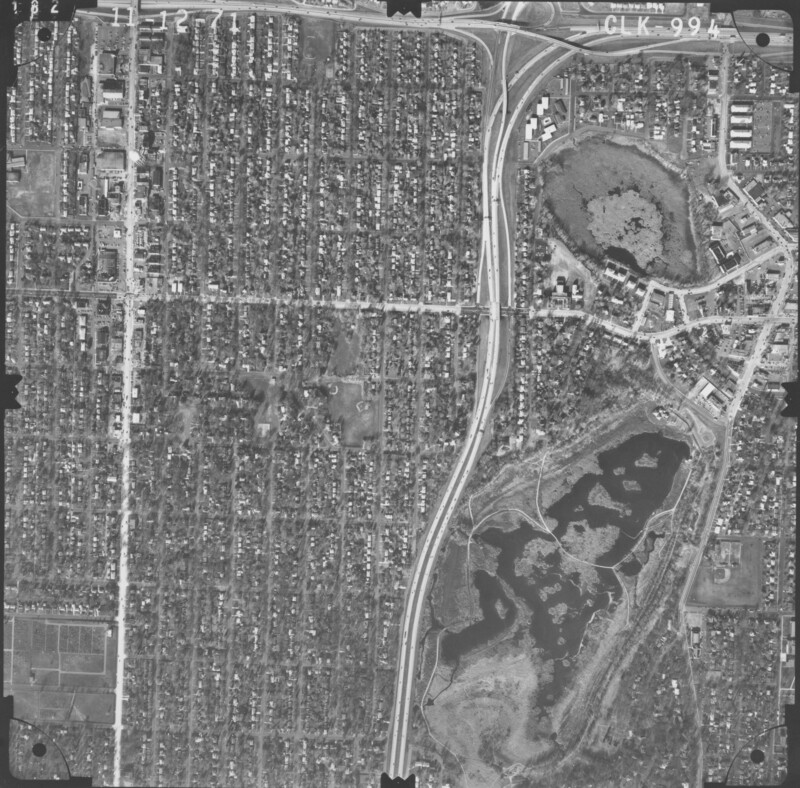 Scanning old aerials of the city, seeing what was lost to freeways/parking lots, etc (plus the amount of commercial spaces that languished over the years), I don’t know how we couldn’t conclude that most Minneapolis residents lost easy/multi-modal access to around 30% of their daily amenities. In Richfield’s case, a 1-mile proximity is pointless, as the entire city is within 1 mile of a freeway. Because of this, I substituted 1/2-mile proximity for 1 mile. Richfield has just over 7 square miles. Over 5 of that (73.5%…almost 3/4 of the city) is within 1/2 mile. Just over 3 square miles (or 43%) is within 1/4 mile. Factoring out the crazy city limits east of Old Cedar Ave drops these percentages by about 1% each. This map is interesting, however the basic buffer analysis is too simple and it misses many nuances, making this far from a full picture of the impact of freeway proximity. All land within a quarter mile of a freeway is not created equal. Considerations should include constructed sound barriers, elevated freeway (ie 35W and Lake), depressed freeway, surrounding open space and tree cover, proximity to interchanges, and more. That said, the 80% figure of within one mile of a freeway in a city touted for its small town feel and accessibility to nature/parks is amazing, I currently reside in Boston (MPLS transplant), which I would guess is a fraction of that. I thought about including ramps, but I was in a hurry to get this out before class this morning and it would’ve taken a lot of editing. Also, there isn’t a readily available shapefile that includes right-of-way/sound barriers/etc etc. That said, given that, in most cases, we’re talking about at most another 100ft of width, it’s not much additional, and is effectively a rounding error for the 1-mile buffer. This was also intended to generally conceptualize the situation. What you’re suggesting is a much more rigorous exercise requiring several (seemingly unbuilt/unavailable) datasets and analysis. I.e. how much do you factor elevated versus depressed grade? Tree cover vs. open space? Etc etc. As for why I included Hiawatha Ave and not Olson Hwy…one could argue semantics in some sense, but Hiawatha Ave is cited far more than Olson Hwy in literature, discussion, and also in the past on Streets.MN as a dividing barrier between neighborhoods and for pedestrians in ways similar to the dividing characteristics of freeways. Hiawatha also went much farther than Olson Hwy in freeway planning, and there are noticeable differences in feel between the two roadways. Furthermore, even if I were strictly going with freeways only, that still would have included Hiawatha north of 26th. Impact to what I was trying to portray here is much more significant with Hiawatha than it is with Olson Hwy. Because of Olson Hwy’s relative proximity to I-394, including it would add roughly 0.5 square mile (basically 1%) to the two proximity analyses. As far as distance, an alternative to a simple buffer is a network analysis to get “within ## distance/minutes drive of freeway”. Depends on what you’re trying to show, though. does the Olson Memorial section have more cross street access? It sure feels like it, but I’m not over there very often so I might just have always been on routes that cross easily. 55 & 35 feel like walls around the neighborhoods. Ramp access vs. ability to cross without getting on the highway would be an interesting way to look at it, when you have time. Olson Highway should have been included (or else Hiawatha excluded). They’re both non-freeway principal arterials, the only ones in the city. For what it’s worth, it wouldn’t actually change the map very much. About 0.5 square mile or roughly 1%, as I noted above. Thanks for putting this map together. When I first moved to Minneapolis, one of my first reactions was that the highway network felt massive so I am not suprised to see that so much of the city is within a mile of a freeway. How people perceive the mobility benefit of being close to the freeway seems to vary. I don’t know the situation in Minneapolis, but in California the wealthiest people make sure that freeways don’t come too close. For example, in the early 1960’s, Beverly Hills defeated a proposal for a “Beverly Hills Freeway” that would run through the town, and it’s roughly 3 miles from the center of that city to the nearest freeway. The same pattern holds in the San Francisco area, except for a few relatively recently gentrified neighborhoods in San Francisco. People like the idea of being near a freeway, until they’re standing in the yard or house and hear the noise. Similar even for 45 mph 2-lane county roads. There’s a reason France Ave through Edina has a 30 mph speed limit instead of the 45 that the county would like it to be given its traffic volume.